Number series is important for various competitive examinations. In this category of questions, a series of various numbers is given with a blank . We are supposed to find out a pattern between every number and its predecessor and find out the answer using the same logic. The best way of approaching number series questions is to observe the difference between various terms. If we see a constant difference, then it’s a constant difference series. If the difference is decreasing or increasing by a constant number , then it is a series of type 2 or type 3. But if there is no such increase or decrease in the difference, then try dividing the 2nd term with the first, third with the second and so on. If you obtain the same number each time, then it is a product series. Also , if none of these seem to work, then you can try writing each term as a product of two factors and try to see if there is any pattern. If you still observe no pattern and the difference is increasing or decreasing rapidly, then try to look for square/ cube series. If the difference is increasing and decreasing in some fixed manner, then it is a type of combination series. In this kind of series, any 2 consecutive numbers have the same difference between them. For example : 1 , 5 , 9 , 13 , ? We can observe that we are adding 4 to the previous number to obtain the next number. So, answer here will be 13+4 = 17. In this type of series, the difference between two consecutive terms keep on increasing as we move forward in a series. Let us try to use this theory in a question. We can clearly observe that the series is increasing with the difference : +1, +2, +3 ,+4 , +5. So, we will obtain our number by adding 6 to 16 which gives us 22. In this type of series, the difference between two consecutive terms keep on decreasing as we move forward in a series. Let us try to use this with some modification in the previous question that we did. We can clearly observe that the series is decreasing with the difference : -5, -4, -3 ,-2 . So, we will obtain our number by subtracting 1 from 2 which gives us 1. We can have series where the terms are related to the squares/ cubes of numbers. We can have a lot of variations here. Let us look at some of the possibilities. 1, 9, 25, 49 , ? We can observe that the above series is square of odd numbers starting from one. So our answer will be 9^2 = 81. 1 , 1 , 2 , 4 , 3 , 9 , 4 , ? We observe here that the series is formed by writing numbers starting from 1 along with its square as the next number i.e. ( 1 , 12) , (2, 22) and so on. So we obtain our answer as 16 which is 42. 9 , 28 , ? , 126. The answer for above question will be 65, let us discuss how. The blank should have 43+1. Hence, the answer is 65. 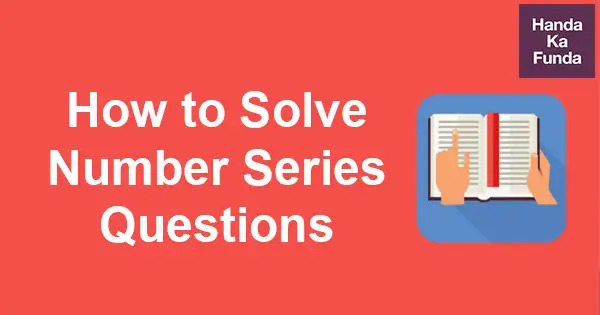 This kind of series has more than 1 type of arithmetic operations which have been performed or it can also have 2 different series which have been combined to form a single series. This kind of series is the the most asked and the most important among all the types of series that we have discussed so far. 1, 3 , 6 , 2 , 6 , 9 , 3 , 9 , ? The first term 1 is multiplied by 3 to give the second term, 3 has been added to the second term to get the third term. The next term is 2 which is 1 more than the 1st term. It is multiplied with 3 to give next term and the process is continued. With this process, we obtain our answer as 12. 6, 10 , 7, 11 , 8 , 12 , ? 1st , 3rd , 5th terms make an increasing series of 6 , 7 , 8….. . The 2nd , 4th and 7th term make a series of 10 , 11 , 12… . So, our answer will be 9 which is the 7th term of the original series. Some series do not come under any of the above mentioned categories but are very important and also asked in many examinations. The series of prime numbers or any other related operation done on it comes under this category. 9, 25 , 49 , 121 , ? The above series is the squares of prime numbers. So next term will be square of 13 which is 169. 1. 49 , 1625 , 3649 , ? Solution : Each term in the above series is combination of squares of 2 numbers i.e. 22 32 , 42 52 , 62 72 . So, our answer will be 6481. 2. Look at this series: 40, 40, 26, 26 , 12 , ? … What number should come next? Solution:Answer is 12. Each number is repeated or firstly 0 is added to each number and then 14 is subtracted from it. 3. 2 , 4 , 11 , 37 , ? 4. 6 , 3 , 3, 4.5 , 9, ? Solution : We see that no decreasing or increasing difference logic is applicable here. So, we find out the ratios of every term with its predecessor. We get the following values: 0.5 , 1 , 1.5 , 2 . This makes it clear that 9 should be multiplied by 2.5 in order to obtain the next number. Therefore, the answer is 9* 2.5 = 22.5 . 5. 8 , 15 , 26 , 39 , ? We observe that the difference is the series of prime numbers. According to this logic , 17 should be added to 39 to obtain the answer. Hence, the answer is 56. 6. Consider the series: 42, 40, 36, 34, 30, 28, … What number should come next? 7. 24 , 30 , 36 , 42 , 54 , 60 , 68 . Find out the wrong term in the series. Solution: Each term is the sum of 2 consecutive prime numbers. So, according to this logic, 54 is the wrong term. We should have 52 in its place. 8. 17 , ? , 102 , 408 , 2040 . Find out the missing number. Solution: We can see that the series is increasing rapidly. Let us find out the ratios of every 2 consecutive terms. Therefore , our answer is 34. 9. 49, 47, 45 , 42 , 40 ,38 , 35, 33 ,31 , 28, ? , ? Solution: 26 24 is the answer. It is an alternating subtraction series where 2 is subtracted twice and then 3 is subtracted one and this pattern is continued. 10. 1 , 8 , 9 , 64 , 25 , 216 , ? 12 , 23 , 32 , 43 , 52 , 63 , 72. 11. 1 , 4 , 9 , 1 , 6 , 2 , 5 , ? , ? Solution: At a first glance it is very difficult to see any kind of pattern here. Any kind of pattern among increasing, decreasing, product , square , cube etc does not seem to be working here. But we can observe that 1 , 4 , 9 are squares of 1 , 2 , 3 respectively. And after that should come 16 but instead of that we have 1 ,6 . After that instead of 25 , we have 2, 5. So , we can come to the conclusion that when the squares start taking 2 digits, instead of writing them as a 2 digit number , we simply separate them into 2 different terms. So, our next term will be 3 ,6 . Tip: During the exam, if you feel that you are not able to figure out the pattern in 30-45 seconds, it is better to leave the question for the time being and move on to the next one. You can revisit the question later , if time permits. Logical Reasoning – Set 1: A high security research lab requires the researchers to set a pass key sequence based on the scan of the five fingers of their left hands. Logical Reasoning – Set 4: A tea taster was assigned to rate teas from six different locations – Munnar, Wayanad, Ooty, Darjeeling, Assam and Himachal. Logical Reasoning – Set 5: Four cars need to travel from Akala (A) to Bakala (B). Two routes are available, one via Mamur (M) and the other via Nanur (N). Logical Reasoning – Set 6: A new airlines company is planning to start operations in a country. Logical Reasoning – Set 7: In a square layout of size 5m × 5m, 25 equal sized square platforms of different heights are built. Logical Reasoning – Set 8: There are 21 employees working in a division, out of whom 10 are special-skilled employees (SE) and the remaining are regular skilled employees (RE). Logical Reasoning – Set 9: Healthy Bites is a fast food joint serving three items: burgers, fries and ice cream. Nice article. Categorising number series and then explaining each is very helpful. Such an informative article… Thanks a lot. 2.3 : 8 :: 3.4 : ?